e-pages, 282. At the time of this review (5/22/18), the book holds a 5-star review on Amazon with 2 reviews. 3.5 Reese’s Peanut-Butter Eggs, Hearts, or Trees (stick-to-your-ribs good)—see below, take with a cup of coffee for my reading bias. “Billionaire chimera-shifter Kyle Mara’s hold on his humanity is slipping away. Fortunately, his mate has at last been revealed. Unfortunately, she’s the wicked witch who almost killed one of his brothers. “Backed into a corner by her father, CJ Bansbach had one job to do: bring back chimera genetic material for cloning and kill the donor. Her failure resulted in a year of imprisonment and torture. Being broken out by a chimera on the verge of going feral, even if he kills her or turns her over to the Ethereal council for judgement, seems like a change for the better. Until he tells her she’s his mate. Watch the trailer Shah put together. 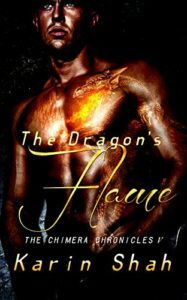 Dragon’s Flame, a paranormal romance by Karin Shah, is the fifth novel in her Chimera Chronicles. It’s Kyle’s story, and the first one where the primary form is dragon rather than lion. As the eldest brother, and in keeping with a dragon’s love of treasure, Kyle has amassed the wealth from his businesses to bankroll a desperate search for his brothers. In each book before, Shah has made no bones about how close Kyle is to going feral—the dangerous stage when an unmated chimera loses himself to the alternate form. In that state, the human mind loses the battle to the animal, and for the sake of all humanity, someone must put the chimera down. Kyle has tasked his best friend, the likeable demon John, with that burden. Conflict drives the book. Deliciously ironic, Kyle is destined for the villain in a previous brother’s tale, talented (but dark) witch CJ. Their story revolves around a quest to find the artifact pieces needed for Mara family friend, super-talented witch Thalia, to break the mate bond. Both risk their lives to find the artifact, knowing each must be wrong for the other. But the heart wants what the heart wants. Part of the fun of Shah’s writing is the family dynamics, each “found” brother and his pregnant mate. As the cast grows in what will be a series of seven novel, they become secondary characters in the next tale. How can Ky fall for the very woman who tried to kill Anjali and Jake (In Like a Lion)? Shah incorporates deeper conflict in that CJ’s father is a higher-up in the brutal “Omega Corp.,” which wants a chimera in its stable. During Ky’s adventures with CJ, we’ll have the insider’s view of what it’s like to work for an evil father, and an evil corporation, and now to be falling for a man whose family she has so wronged. “The blue dragon whose neck he’d only just had in his jaws, reared back shaking his massive head, as if confused.” (page 62). Like most of the books, we’ll have that tidbit of where the next brother’s hiding, even if the bother who gets the hit doesn’t pick up on the clue because of the conflict of falling for the woman who’s done such damage to his family. As I say each book, I enjoy the characters and the plot. I will read the series through its seventh book because I do love Shah’s characters, her plots, and her twists. C’mon, making a man of honor fall for the witch who tried to kill family members? That’s a crowning jewel in setting characters along a path fraught with conflict. 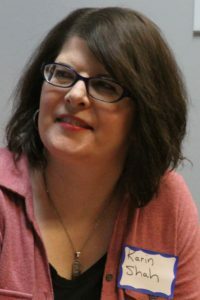 This entry was posted in Book Reviews, Reading, Uncategorized and tagged amreading, Book Blogger, Book Review, Karin Shah, Paranormal Romance. Bookmark the permalink.